If you caught this little couples getaway on my Instagram stories last week, you’d probably have seen this blog post coming a mile away. As a born and raised Edmontonian this isn’t my first visit to Banff National Park by any means. We have frequented the area bi-yearly for decades. 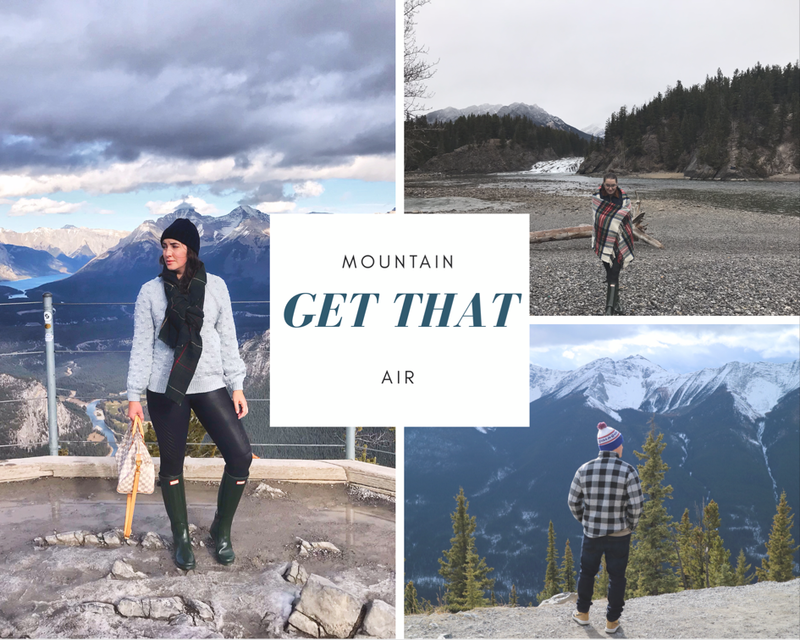 Luckily enough being an avid mountain air seeker, I’ve had the pleasure of trying many establishments and I wanted to share a few of our favourites in hopes this read will help you plan out your next escape. 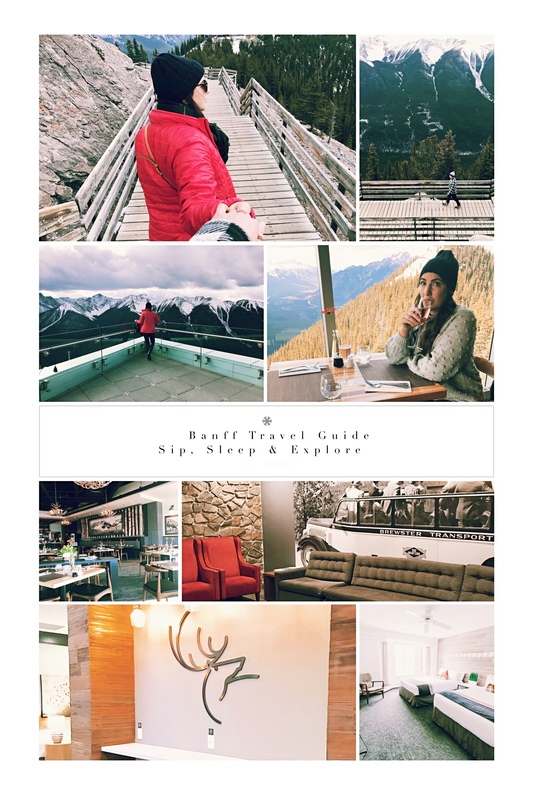 Here are my current hotels, restaurants and attractions of mention for Banff in 2018. We’ve done the full range of accommodation options for Banff over the years: from rented house, cabins to hotels. I will say when booking a couples trip, I highly prefer a main street Banff hotel to any of the other options. Walking access to restaurants and sips being the main reason. And in all honesty, house keeping when I’m away from kids for some romance is a must. Elk + Avenue Hotel (formerly the Banff International): Location, location, location… located in main street Banff, this modern and renovated hotel is steps away from nightlife, shopping and eats. We love the decor added in the last update to this hotel, it’s a trendy comfortable “après-ski” kind of vibe with so many cozy touches. Definitely check the website when booking, currently there is a promo that includes gondola and seasonal festival tickets with your room booking. Who doesn’t love some added value? Honourable Mention Mount Royal Hotel: Although I haven’t stayed at it since it’s new renovations, I can definitely speak to the prime time location in the middle of main street. Visit the website and take a look at the gorgeous updated rooms and that roof top hot tub! Our plan is to try out the new rooms sometime this winter. Let me start off by saying this category is so tough for me. There are almost too many places to mention that are incredible to eat. So to save myself from writing a novel I’m only going to share our current 2 favourites for both taste and experience. Sky Bistro: Dine at the summit of a mountain. Enough said! We enjoyed a relaxed lunch with the most specular views we’ve ever seen from a restaurant. I highly suggest getting a reservation if you are going for a gondola ride to the top of Sulphur Mountain. Chucks: It’s gotta be the Albertan in me but we cannot go to Banff and not get a real Alberta Beef experience. 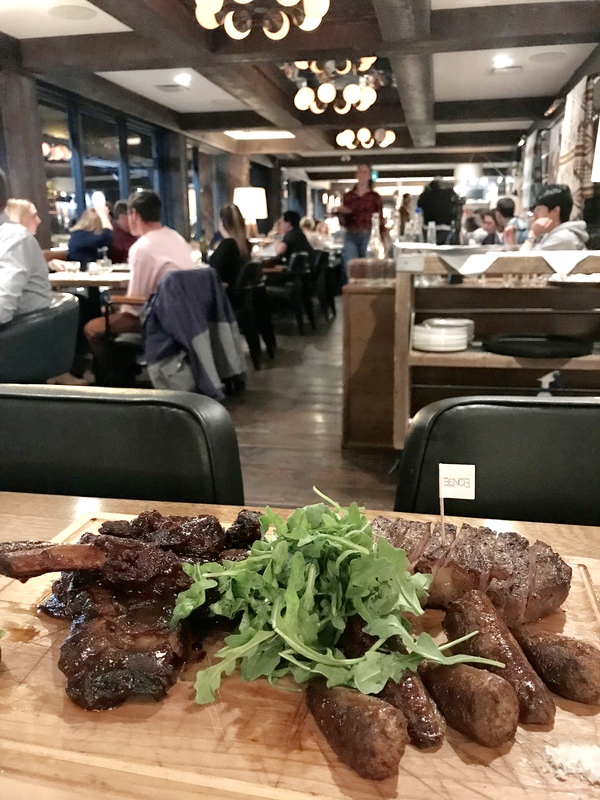 Grass fed, hand picked and aged steaks to choose from this restaurant is a meat lovers dream. You’ll notice we are not the only the ones who think so, you’ll need a reservation during peak dining hours or you will be turned away. We shared the the family style platter, The Cow Boy Trail it had something for everyone. A trip to Banff is not complete without taking in some specular views. Between hikes, strolls along the falls or mountain top visits, everything is majestic in the mountains. Here is one experience you don’t want to miss. Banff Gondola at Sulphur Mountain: For the view along, this gondola ride is definitely worth it. As a little side note, check the website you can save by bundling admission with dining, booking in advance or arriving early currently has free admission for children before a specific time. Approximately 7500 feet above Banff this attraction is a must for a breathtaking experience like no other. At the top experience a state-of-the-art facility offering history, shopping and dining. I suggest bringing layers to take a stroll on the boardwalk. I couldn’t get over the view or the elevation! Disclaimer: This post was NOT paid by Pursuit but accommodation/ gondola tickets were provided for trial purposes. This entry was posted in Lifestyle, Local, Sponsored, Travel on November 7, 2018 by admin. Banff sounds amazing. I visited Calgary last spring and fell in love with it. I can’t wait to explore more of Alberta!